Mash the Cheese with a fork. 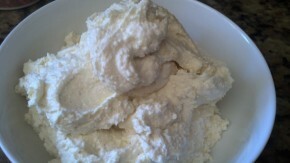 Beat the Eggs and add to the Cheese along with the Sugar and Vanilla. Mix well to combine all the ingredients. Use as filling for the Blintzes. Lay each pancake out on a work surface. Place a tablespoon or so (depending on the size of the pancake) on each pancake. Fold over the sides to make a square. If you prefer long blintzes, just fold over two sides. For the Blintz Casserole, follow the preceding directions. For individual Blintzes, cook the pancake on one side only and place the filling on the cooked side. Just before you are ready to serve, fry the Blintzes in a hot skillet with enough Butter to keep them from sticking to the pan. Serve hot with Sour Cream and or Applesauce. Yield: Enough filling for 2 batches of pancakes. For one batch use only 1 large egg or 2 medium.